Ok – so even though I don’t work in the kitchen, that doesn’t mean I don’t get to see everything that goes on around here. Everybody always sees the outside of our cakes. But rarely get a glimpse of what they look like on the inside – until today. In order to achieve a clean, smooth application of fondant, the inside of your cake should be just as clean and smooth. Fondant shows every little imperfection. What “they” don’t’ tell you that this is a very hard technique to master and it takes a lot of time, practice and patience. Our head chef has fondanted hundreds and hundreds of cakes and has mastered this technique beautifully. He will tell you though that on a hot and humid day (even with great air conditioning) – it can be anybody’s game. When the hot and humid days come, he gets into the bakery really early and does as much as he can before it gets too hot. But he gets it done with precision and maybe a little frustration here and there. But the out come is a smooth canvas that we can work on. Of course it starts off by baking your layers of cakes. The tops of these cakes are still a little uneven, so the tops get cut off so it's a flat surface (remember the scrap bowl, put the tops in the scrap bowl!). 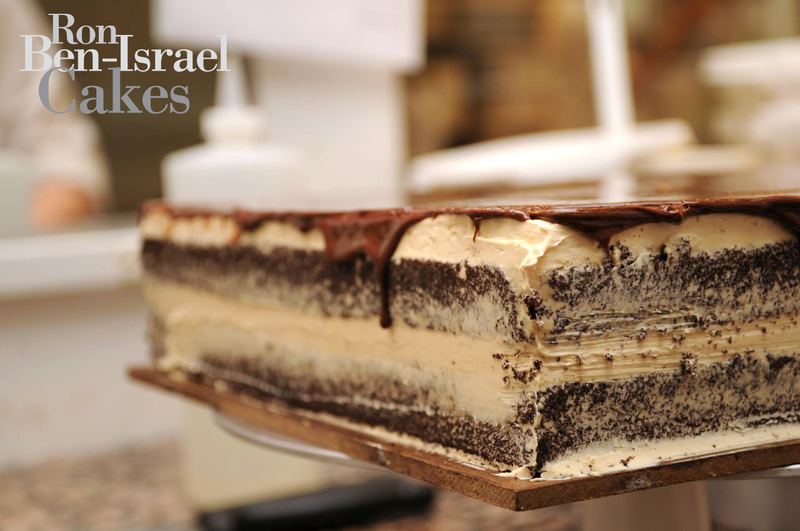 Our head chef Jeffrey, is building the layers of a cake. 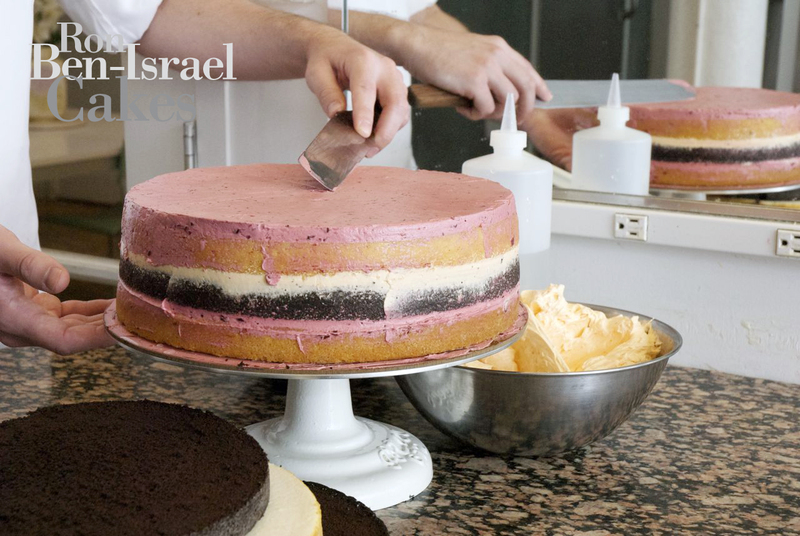 He measures each layer of buttercream so it is consistent. 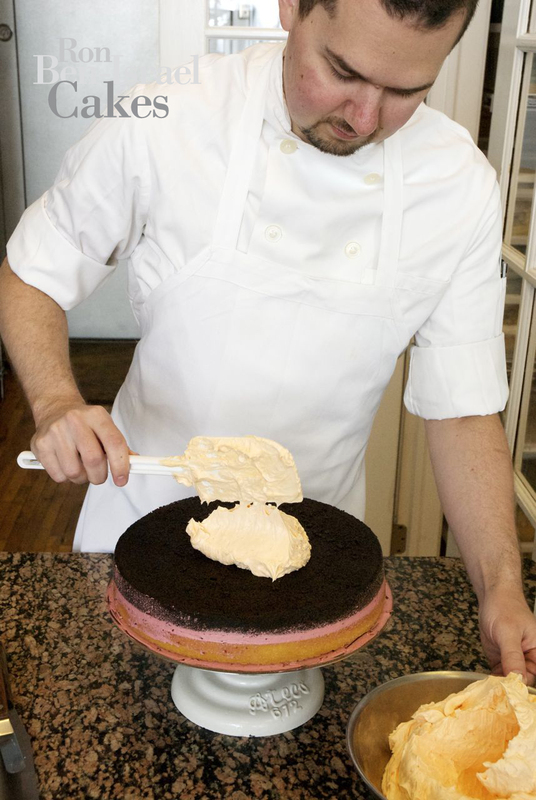 Jeffrey is making sure each layer of buttercream is even while he builds a tier of cake. This is what one of our finished buttercreamed cakes look like. Smooth and clean. This is a great canvas for laying down your fondant. 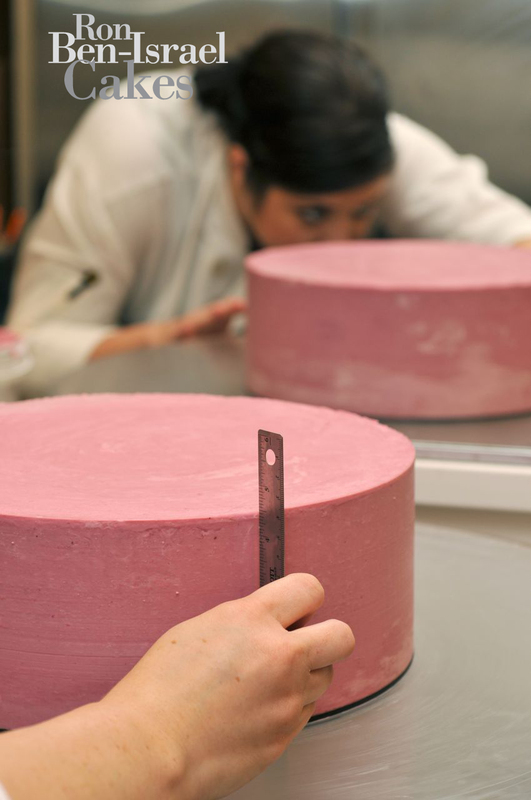 Our intern, Jessica, is measuring the finished cake to make sure it's all even before the fondant gets applied. These are the pictures that I like the best (kind of) – if you know what I mean. As a cake decorator I really appreciate the inside of the cake and how most people don’t realise what goes into making the outside look fabulous – you cant have a fabulous cake if you don’t pay enough attention to what is going on inside. Your buttercream’d cakes are outstanding – I can get ganache to look like this because I find it easier to work with, but buttercream is a whole different ball game! You guys are my inspiration and as far as I am concerned, the only comparison I use for perfection! Thank-you for the post ~ very nice work. Thanks for the pictures..love the look of your cakes..! It is really lovely, I wish I could do that. Thank you for the post, I’ve always wondered how you can get that crisp edge on your cakes. Now I would like to know how thin is your fondat, hoping to see it in some of the future posts. 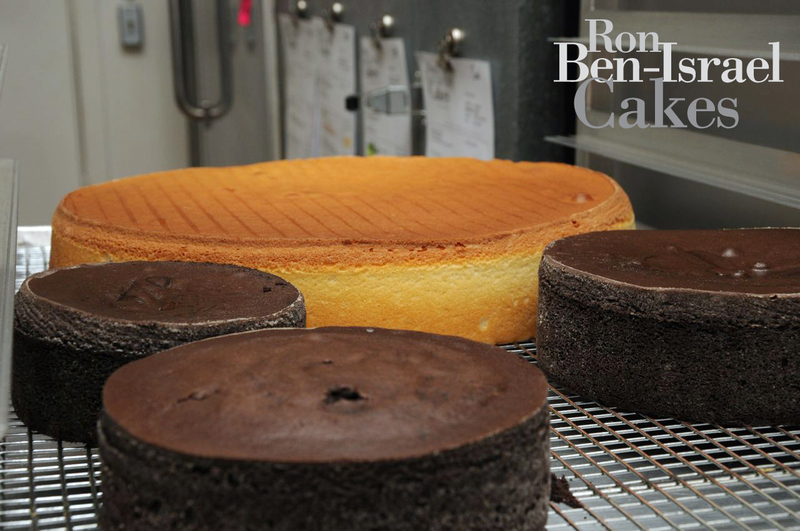 1/16tth of an inch thick – there is a video on youtube of Ron covering a cake with chocolate fondant and he says that he rolls his fondant as thin as he can get it. Its actually not that hard if you have a decent brand of fondant. But let me ask you this, to achieve those crisp clean edges, does it depend on the consistency of the buttercream? Now i am about to get my nails out of my mouth,totally delicious. Rebecca, I love your posts! And it is only because of Ron and believing if he (all of y’all) can use Swiss meringue buttercream exclusively, I can too. Actually I use Italian meringue buttercream, same thing, different prep. It is only with the use of this buttercream and the tips that Ron told us in class, especially the tips Ron told us in class, that I have been able to get pretty close to the same result of fondant on tiers as your bakery. As you said, practice, practice, practice! I am using thinner fondant (thanks to my Somerset [Thanks Nick!]) and the fondant is going on like a dream! Ron and all of your staff have been great inspiration. That and taking the three day class with Ron has really propelled our product to the next level. Reblogged this on Dulcia Bakery. ← Do you make cupcakes?